The vision behind Fulfil is to fulfill the everyday needs of its customers by delivering orders directly to their doorstep at the best price. The vision behind Fulfil is to fulfill the everyday needs of its customers by delivering orders directly to their doorstep at the best price. Fulfil addresses everyday needs ranging from Personal care, Household care, Food & Beverages, Stationery to OTC products. 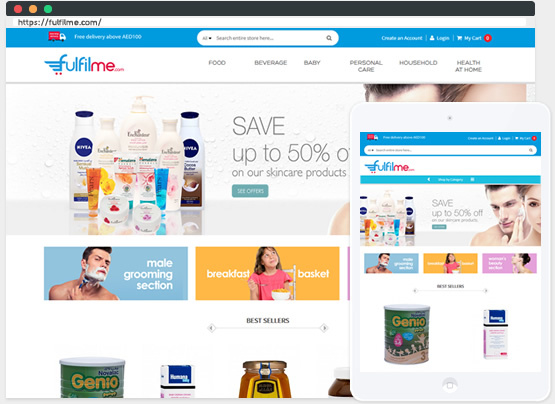 The ecommerce site was developed on the Magento CE platform with payment gateway integration with Comtrust. UCS leveraged the strengths of the Magento Community Edition to create a consolidated end-to-end shopping solution which incorporated features for search, shop and pay in one seamless flow.